Stephen Usery interviews Reif Larsen about his debut novel, The Selected Works of T.S. Spivet. Brand new in paperback, The Selected Works of T.S. 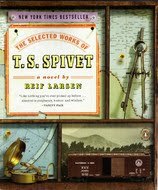 Spivet is about a 12 year-old map maker whose incessant diagramming of the world around him leads him on an amazing journey from his home ranch in Montana to the Smithsonian in Washington, D.C. There's a bonus of sixteen minutes of conversation on the podcast!